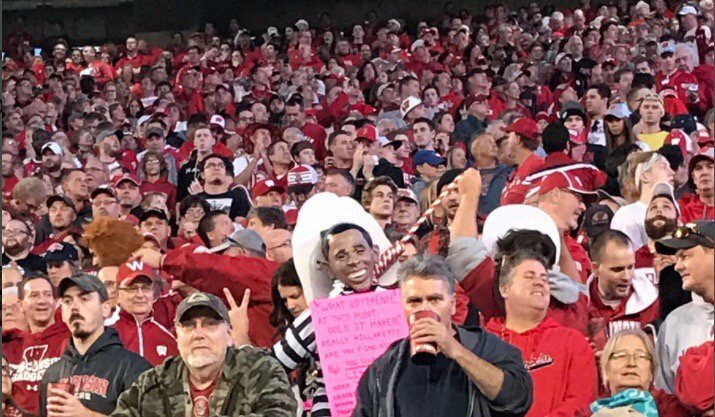 The University of Wisconsin asked a fan wearing a President Obama mask — complete with jail jumpsuit and noose — to remove parts of the costume at last night’s game against Nebraska. Social media pictures depict two game attendees, one with the offending costume and one holding the noose aloft. The fan complied with stadium staff members who asked him to remove the “offensive parts” of the costume, according to a statement from the school. “While [the costume was] repugnant and counter to the values of the university and athletic department, [it] was an exercise of the individual’s right to free speech,” the school said in a statement. The school also that, of the same token, it exercised its right to ask the fan to remove the offensive costume.